In the heart of cosmopolitan St. Kilda. Perfect for the business and leisure traveller, our guests can choose from 4 star, studio, one or two bedroom apartments. 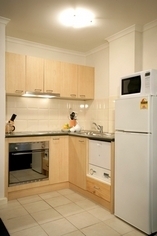 Each apartment is self-contained and includes a fully equipped kitchen and laundry. Comfortably furnished, reverse cycle air-conditioning features in all apartments. Each apartment has a TV, DVD and direct dial phone. 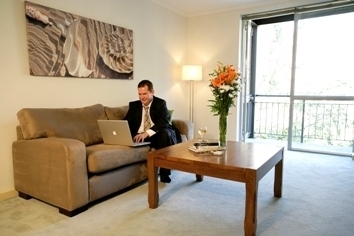 High speed wireless broadband internet is available in all apartments. Quest St Kilda Bayside is a 20 minute tram ride from Melbourne's CBD and even closer to the St Kilda Road business precinct. 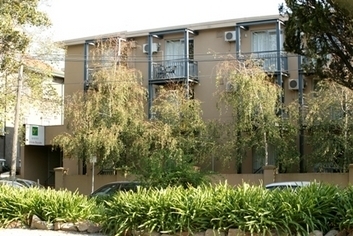 The property is located in a quiet, leafy street, just a quick stroll from the varied sidewalk cafes, restaurants and boutique shopping of trendy Fitzroy and Acland Streets. Enjoy a relaxed check in with easy access to the apartments via elevator from the undercover car park. The after hours answering service provides extra peace of mind at any time of the night. The daily service (Sundays excepted) creates extra time in the day for the business or for leisure. 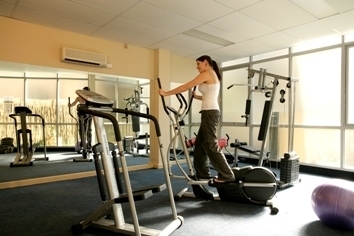 Guests can maintain their daily fitness routine in the in-house, fully equipped gymnasium, or in the summer months, unwind and enjoy a barbecue around our solar heated swimming pool. If you want to spread out that little bit more, then our two bedroom apartment is an ideal alternative. We offer two separate bedrooms, full kitchen, separate laundry, with washing machine & dryer and a living area with that traditional Quest room to move Choose from a variety of bedding configurations The apartment accommodates up to five guests. One extra guest can be accommodated on a rollaway. There is an extra charge for the fifth guest. 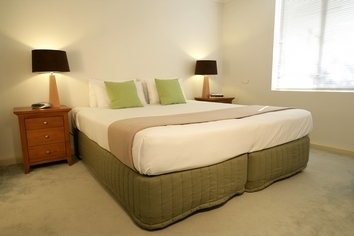 The Studio Suite is an ideal alternative to a traditional hotel room. Guests can stay in an apartment which provides a fully equipped kitchen, private laundry and a spacious living room. This apartment is like the traditional bed-sit, with all of the facilities in one large room. The bathroom is separate! The apartment accommodates up to two guests in a Queen Size bed. 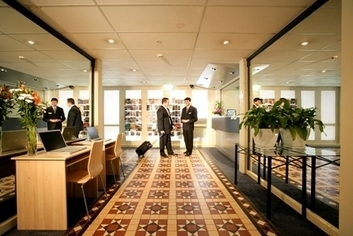 Larger conference facilities available less than 2 minutes walk away. Check in is from 200 pm. Reception hours are 7am to1030pm weekdays and 8am to 10pm weekends. Please call if you are going to be after that time. The night manager will let you in - but have the credit card you used for the booking & ID details available for presentation on arrival.We also require a $300 security bond on check in. Ideal for travellers, St Kilda is easily accessible by tram, bus or car from the airport. If driving from the airport, follow the signs that indicate souther suburbs. Exit the freeway at Kings Way. Follow Kings Way until you arrive at Albert Road. Turn right and continue along Albert Road until you arrive at Beaconsfield Parade (the beach road) turn left and continue along the beach road. Do not make a slight turn to the right once you arrive in St Kilda, but drive over the tram tracks, up the hill and you will see a church. Turn right. Welcome!! Take a shuttle bus, which will bring you just about to our door - $20 per person - pick up from your arrival terminal.